Location: Loch Earn, Stirling, Scotland. 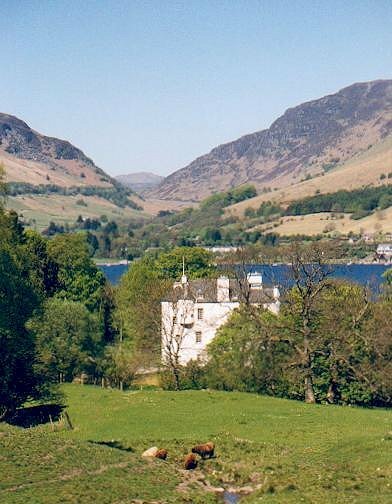 Notes: Edinample Castle is a late 16th century castle on the southern shores of Loch Earn near Balquhidder in the Stirling council area of Scotland. The castle takes the form of a Z-plan tower house, originally built by 'Black' Duncan Campbell (Donnchadh Dubh) of Glenorchy. It is built on land acquired by the Campbells after their campaign for proscription, and subsequent demise of the MacGregors. It is said that Black Duncan pushed the castle's builder off the roof, in part to avoid paying him, but also because he omitted to construct the ramparts that had been requested. It is also said that the ghost of the builder has been seen walking on the roof. The castle was extended in both the 18th and early 20th centuries, but fell into a state of dereliction by the early 1970s. It has now been refurbished for use as a private family home.